Hawaiian Airlines is keen to add and expand partnerships with Asian carriers, capitalising on opportunities as US majors have reduced domestic access to their foreign partners. Hawaiian has already added codeshares with four Asian airlines over the last three years. It is talking to new potential Asian partners and could also expand some of its existing partnerships to include flights to the mainland US. New and expanded partnerships for Hawaiian will further build up Honolulu’s status as a hub for Asia-mainland US traffic. Honolulu has already emerged as an alternative hub for Asia-US flows as Hawaiian Airlines has expanded its own long-haul network over the last five years from one to nine destinations. As Hawaiian slows down its own Asian expansion, partnerships should drive additional revenue and traffic growth and potentially support expansion of its mainland US network. All but one of Hawaiian’s nine long-haul destinations were launched since 2010 as part of a major push into Asia-Pacific designed to diversify Hawaiian’s operation. Hawaiian previously was almost entirely focused on the inter-island and Hawaii-mainland US markets. For several years its only long-haul destination was Sydney, which was launched in 2004. Hawaiian’s long-haul network in Asia-Pacific now accounts for approximately one-quarter of Hawaiian’s revenues compared to about 50% for the US mainland network and 25% for the inter-island network. The inter-island network is served with 18 Boeing 717s along with three ATR 42 turboprops which are operated under the Ohana by Hawaiian brand by Empire Airlines. The rest of Hawaiian’s network is served with the widebody fleet, which currently consist of 18 A330s and 10 767s according to the CAPA Fleet Database. Based on current schedules, the nine long-haul routes currently account for only 9% of the airline’s seats, but about 30% of ASKs. The expansion in Asia-Pacific has primarily been pursued to position Hawaiian to benefit from the growth in inbound visitors to Hawaii from Asia. While Hawaii continues to be an attractive holiday destination for residents of the mainland US there is faster growth from Asian source markets. Hawaiian’s expansion in Asia-Pacific has also opened up opportunities to pursue transit traffic. Hawaiian now offers the fastest transit times on several city pairs between its Asia-Pacific gateways and its secondary mainland US gateways. Hawaiian also has been able to attract a considerable amount of connecting traffic to the main gateways of Los Angeles and San Francisco, which have non-stop options from virtually all of its Asian gateways, by offering a competitive one-stop product. Hawaiian currently accounts for about 50% of total seat capacity at Honolulu. 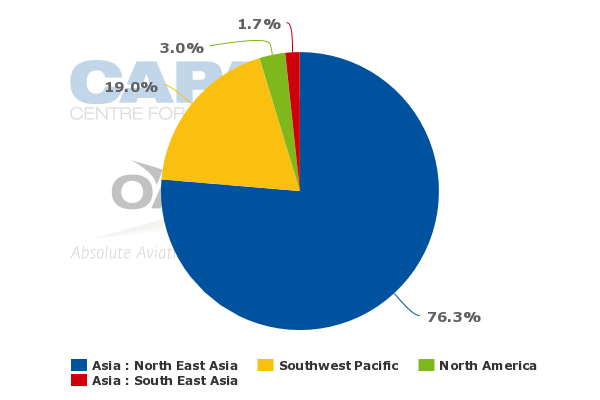 But while Hawaiian's seat share is 61% in the domestic market its share of the international market despite the rapid expansion over the last five years is still only 19%, according to CAPA and OAG data. About 53% of international capacity at Honolulu is provided by Asian carriers, 25% by other US carriers (17% from Delta and 8% from United) and 3% by Canadian carriers (Air Canada and WestJet). All of Honolulu’s international capacity is allocated to Asia-Pacific except the 3% flown by Air Canada and WestJet, which have four and six weekly flights respectively to Vancouver. Of the 12 carriers from Asia-Pacific which serve Honolulu, Hawaiian now codeshares with four – All Nippon Airways (ANA), Air China, China Airlines (CAL) and Korean Air (KAL). These four carriers account for about 21% of total international seat capacity at Honolulu. Three years ago Hawaiian only had a codeshare with one airline from Asia-Pacific, KAL. Codeshares with ANA and Virgin Australia were added in late 2011. A codeshare with CAL was launched in 2013 and, most recently, a codeshare with Air China was launched in early 2014. As Virgin Australia does not serve Hawaii, this partnership covers Hawaiian’s flights to Australia and Virgin Australia-operated domestic connections in Australia. Hawaiian also currently codeshares with seven US carriers – American, Delta, JetBlue, United, Virgin America, Continental (now part of United) and US Airways (now part of American). Delta, JetBlue and Virgin America were added over the last five years (although Hawaiian did have a codeshare back in 2009 with Northwest Airlines, which was subsequently swallowed by Delta). The Delta codeshare was added in 2010 while the JetBlue and Virgin America codeshares began in 2012. Hawaiian has traditionally worked with most US majors, which are particularly keen to access Hawaiian’s inter-island network. Hawaiian also has active interline agreements with 28 airlines. These include several airlines that do not serve Hawaii but are able to access Honolulu by interlining via intermediary points on Hawaiian-operated flights. It also includes six Asia-Pacific carriers which serve Hawaii – Japan Airlines, Asiana, Qantas, Air New Zealand, Philippine Airlines and Fiji Airlines (listed in order of largest to smallest in the Honolulu market). The only Asia-Pacific carriers that serve Honolulu but do not have codeshares or interlines with Hawaiian are Qantas budget subsidiary Jetstar and China Eastern. Some of Hawaiian’s interline partners which serve Honolulu could upgrade their partnership to codeshares. Airlines that are considering launching services to Honolulu could also look to tie-up with Hawaiian as feed from Hawaiian would help make potential new routes viable. Hawaiian is in a strong position to expand its existing partnerships with Asian airlines. Hawaiian’s codeshares with Asian carriers now generally only cover connections on Hawaiian’s inter-island network as well as connections beyond its Asian gateways that are operated by partner carriers. The codeshares do not generally include flights beyond Honolulu to destinations in the mainland US. Hawaiian’s network of 11 destinations in the mainland US would be attractive to existing and potential new Asian partners. All 11 destinations are served from its Honolulu hub. Five of these destinations are not served by any of the 12 Asia-Pacific airlines serving Honolulu including Oakland, Portland, Phoenix, San Diego and Sacramento (although Oakland is close to San Francisco). Another two destinations are only served by one of the 12 carriers – Las Vegas (served by KAL) and San Jose (served by ANA). Los Angeles and San Francisco are served by virtually all 12 of the carriers while New York is served by most and Seattle by one third. Hawaiian is able to offer Asian partners good access to its mainland US capacity, resulting in an attractive alternative for Asian carriers as they increasingly struggle to secure domestic US seats from US majors. In speaking at last month’s CAPA Australia Pacific Aviation Summit, Hawaiian CEO Mark Dunkerley highlighted how consolidation in the US airline industry, which has included four mergers in five years, has impacted foreign carriers. As the US majors have consolidated and reduced domestic capacity, resulting in higher load factors and yields, they have reduced the number of seats available to foreign carriers. Mr Dunkerley told CAPA TV after the presentation that Hawaiian has seen an increase in “the number of foreign carriers that have come to visit Honolulu and are sending us emails and calling us up”. He said the potential Asian partners are “asking for the sorts of relationships that will help them use our network to gain access” that they previously had with major US airlines. Hawaiian believes US majors have reduced domestic access to foreign airlines after determining that connecting traffic from foreign carriers was least strategically important and therefore most easily dispensed with. Such decisions give US majors an advantage in connecting secondary US cities with Asia as Asian airlines in many cases are now struggling to gain access to affordable seats on domestic flights beyond their US gateways. Hawaiian believes there is particularly a large gap between fares offered by US and foreign airlines in US connection markets from Hong Kong, Beijing, Shanghai and Taipei. There is less of a gap in connecting markets from Tokyo Narita and Sydney. The United-ANA and American-JAL joint ventures as well as the strong American-Qantas partnership explain the relatively similar fares offered in connecting markets from Tokyo and Sydney compared to the other Asian gateways. Most Asian airlines do not have such close partnerships with US majors, leaving them without sufficient or competitively priced access to US domestic capacity. Mr Dunkerley in his presentation at the CAPA Summit highlighted two specific examples – the Hong Kong-Washington Dulles and Seoul-Portland (Oregon) markets, neither of which currently has any non-stop options. On Hong Kong-Washington, United fares are very slightly more than it charges on Hong Kong-San Francisco. While Singapore Airlines fares are competitive with United on Hong Kong-San Francisco they are almost three times the United fares on Hong Kong-Washington when including a United-operated connection from San Francisco to Washington. On Seoul-Portland, Delta fares are very slightly more than it charges on Seoul-Seattle. While Korean Air fares are competitive with Delta on Seoul-Seattle they are almost three times the Delta fares on Seoul-Portland when including a Delta-operated connection from Seattle to Portland. Asian airlines are effectively being shut out of US behind-gateway markets by the major airlines. Foreign carriers have been able to offset some of this impact by forging partnerships with smaller US domestic airlines such as Alaska Airlines, JetBlue and Virgin America. The Hawaiian presentation pointed out the KAL-Alaska option on Seoul-Portland which provides a through fare that is competitive with the Delta fare. The Hawaiian presentation did not mention any alternative option for Singapore Airlines in the Hong Kong-Washington market but SIA now works with both JetBlue and Virgin America. The latter serves the San Francisco-Washington route. Hawaiian sees an opportunity here as it is able to offer another option to foreign airlines that is not currently being utilised as most codeshares on Hawaiian metal only include inter-island flights. Hawaiian is generally not able to offer the breadth of connections as the other second tier US carriers. JetBlue has a particularly attractive network for foreign airlines serving New York JFK and has been extremely successful at building up a partnership portfolio. But Hawaiian offers a potentially attractive alternative for accessing several offline destinations in the western US. Hawaiian currently only has one destination in the eastern two-thirds of the continental US, New York, which it launched in 2012. But as Hawaiian builds up its partnership portfolio the carrier will look at launching other routes in the eastern half of the US that could be viable with feed. Additional secondary destinations in the western US could also become viable through a combination of feed and new aircraft technology. Hawaiian in 2013 ordered 16 A321neos, which are expected to be delivered from late 2017 and provide improved operating economics on medium-haul routes to the western US. In Jul-2014 Hawaiian also placed orders for six of the newly launched A330-800neo for delivery from 2019, while dropping its orders for six A350-800s. The A330-800neo will significantly improve operating economics across Hawaiian’s long-haul network, potentially enabling the launch of new routes to Asia which are not viable with the current A330-200s. Hawaiian expects the A330-800neo will provide about two-thirds of the operating cost gains of the A350-800 but at a significantly lower capital cost. Hawaiian already relies on transit traffic to balance out the cycles in the Hawaii-mainland US market. As new markets in the mainland US are considered Hawaiian will take into account connecting traffic opportunities – both to its own network and codeshare connections with partners – that in some cases are sufficient to make a route viable on a year-round basis that otherwise would never work. Mr Dunkerley says there are periods of the year such as May when demand in the mainland US market for Hawaii vacations is relatively weak. Hawaiian as a result already sees a large fluctuation in its transit traffic figures as it tries to fill up mainland US capacity with Asian connecting traffic during certain periods. Asia connecting traffic also balances out Hawaiian’s traffic mix as some one-stop markets such as Sydney-Seattle have a large portion of business passengers but lack non-stop options. Hawaiian is generally a leisure carrier but has a business class as well as a premium economy product on a growing portion of its widebody fleet. Even with its own connection traffic Hawaiian has the spare capacity to offer seats to foreign partners, particularly during periods in which US majors lack the extra capacity. For example while May is a low peak month for Hawaiian it is a high peak month for US majors. Asian carriers could potentially manage their flows to take advantage of seasonal fluctuations in the domestic US market, using Hawaii as a connection point for traffic heading to or from the US mainland during periods when the local Hawaii-US mainland market is down but seats are hard to secure on domestic routes within the mainland. While Hawaiian is keen to expand partnerships in Asia the airline is also committed to maintaining an extensive online network in Asia-Pacific. Hawaiian’s long-haul operation has not been profitable in recent quarters but it is making adjustments and is confident in the long-term sustainability of the nine long-haul routes it currently serves. Service to Taipei was cut in Apr-2014 less than a year after it was launched while Fukuoka in southern Japan was terminated in Jun-2014 after a run of just over two years. Manila, which had been served for about four years, was also suspended in Aug-2013. Indeed Hawaiian has maintained eight of the 11 long-haul routes launched since 2010. The ambitious international expansion, which has had its share of sceptics, was inevitably going to have at least a few seatbacks. “We always expected we would make a bunch of calls and perhaps not every single one would work out,” Mr Dunkerley said. Hawaiian has essentially concluded its most challenging phase. As the long-haul routes launched over the last few years continue to mature the airline’s investment in building up its Asia-Pacific network should start to bear fruit. Opportunities to expand existing partnerships and forge new ones with Asian carriers will be icing on the cake, providing valuable incremental revenue and traffic. Hawaiian is right to take advantage of the strategies of its larger competitors and position itself to try to benefit from the consolidation in the US industry and the growing need among Asian carriers to source alternative options for accessing domestic US connections. Inevitably Hawaiian will start to carry several codes on its US mainland services as such partnerships provide a win-win proposition for both Hawaiian and the Asian carriers which are now struggling to maintain effective offline access in key US markets.